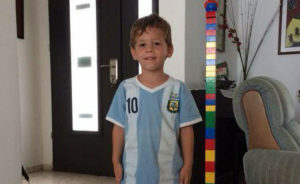 Daniel Tragerman was a normal four and a half year old little boy. He has a younger sister and a four-month-old baby brother. Other than the fact that he was sweet and cherished, there’s not much most of us can say about him. We never got a chance to celebrate his life. Only in death, did most of Israel learn of him. If it helps his parents at all, Daniel has never been forgotten. At his funeral, his mother told us a little. “You were smart, sensitive, and always more advanced than your age.” A perfect child, now gone three years. Three years since that terrible day when a mortar flew into their homes. Mere seconds to act; not enough time to get three small children to a bomb shelter in time. The parents pretty much had Daniel trained to run to the bomb shelter; they would each grab one of the younger ones and get to safety. This time, it didn’t work. When we sat shiva according to the Jewish custom of mourning, we heard about the decision to establish a Commission of Inquiry to investigate the incidents during the war. The announcement on this issue was transferred to the Prime Minister when we learned just a half an hour prior to that Daniel was murdered. It is possible that this was communicated when our Daniel was still lying there in the living room of our house. The investigative committee will not be asked to examine how terrorist operatives fired inside UN buildings. It will not be asked to examine how Hamas abused the Palestinian people and how its members force Gazan residents to dig tunnels with the sole purpose of waging terrorism against Israel. Why are you silent? Does your silence testify that you accept the abuse and mistreatment of the Israeli and Palestinian people? We were a happy family. We lived in Kibbutz Nahal Oz close to Gaza, where the threat of the tunnels reached. At night, we heard voices and noises digging beneath us. Could you, Mr. Secretary General, imagine how we live? How we lived in constant fear of mortars exploding and terrorists reaching us from the tunnels that were sabotaged? What can you say about a child killed so suddenly, so brutally? What words of comfort could you possibly offer his parents? Really, all we can do is say that three years later, we still remember Daniel and more importantly, we will never forget him.